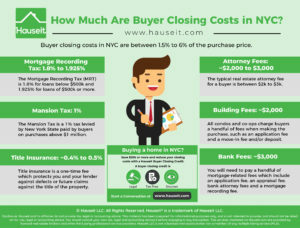 Buyer closing costs in NYC are between 1.5% to 6% of the purchase price. Buyer closing costs are higher for condos vs. co-ops, and closing costs are the highest for new developments (also known as sponsor sales). 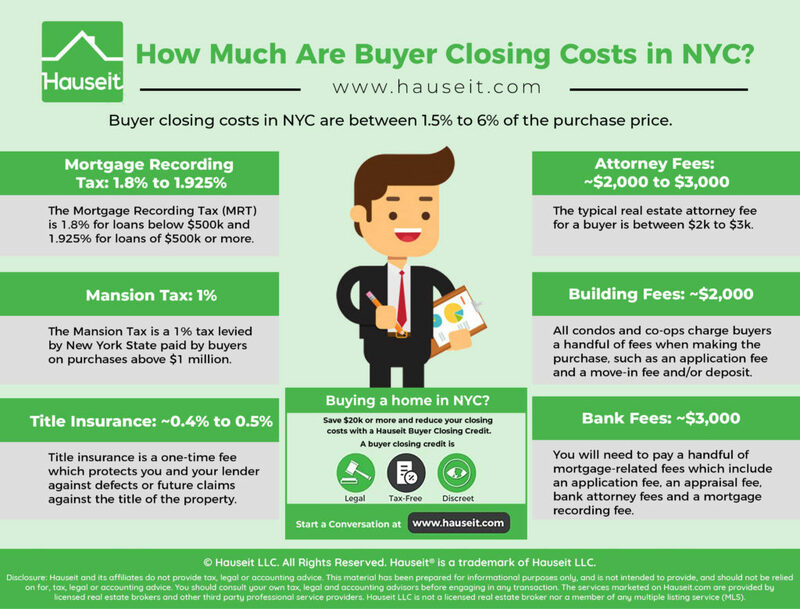 The largest buyer closing costs in NYC include the Mortgage Recording Tax (1.8% to 1.925%) and the Mansion Tax (1%) on purchases of $1 million or more. Other large buyer closing costs include Title Insurance for condos and houses, real estate attorney fees as well as lender, building and miscellaneous fees. 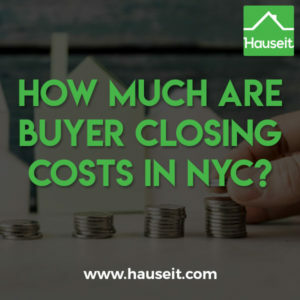 You can estimate your buyer closing costs in NYC using Hauseit’s interactive closing cost for buyers. The Mortgage Recording Tax (MRT) is 1.8% for loans below $500k and 1.925% for loans of $500k or more. The actual MRT rates are 2.05% and 2.175%, however most banks generally cover 0.25% of the MRT for residential deals. 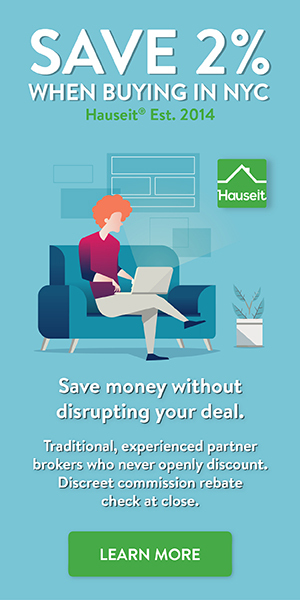 Estimate your Mortgage Recording Tax bill using Hauseit’s Interactive Mortgage Recording Tax Calculator for NYC. The Mortgage Recording Tax is not applicable to co-ops, as the tax only applies to real property. Co-ops are not considered to be real property since unit owners actually purchase shares in the private corporation that owns the co-op. In addition to receiving shares, a co-op buyer is also provided with a proprietary lease which entitles her or him to reside in the specific apartment being purchased. Because the MRT is based on the loan size as opposed to the purchase price, you can lower your buyer closing costs by paying all-cash or by increasing the size of your down payment. The Mansion Tax is a 1% tax paid by buyers on purchases above $1 million. The Mansion Tax is a statewide tax collected by the New York State Department of Taxation and Finance. Originally imposed in 1989, the tax has not been adjusted for inflation since it was passed into law. As a result, the name ‘Mansion Tax’ is a misnomer since it now applies to the sale of properties which are very un-mansion like in nature: such as small 1br apartments or even alcove studios in Manhattan. The Mansion Tax is technically an additional Transfer Tax, however it’s not usually categorized alongside the NYC & NYS Transfer Taxes since they’re paid by sellers and it’s customary for the buyer to pay the Mansion Tax. There have discussions in recent years about increasing the Mansion Tax and possibly broadening the Mortgage Recording Tax to apply to co-ops in order to raise more revenue. However, no changes have actually been passed into law as of yet. Title Insurance is approximately 0.4% to 0.5% of the purchase price. It’s a one-time fee which provides a buyer with an insurance policy against defects or future claims against the title of the property being purchased which were unknown at the time of purchase. Here’s an example: Let’s say you purchase a $2m condo in 2015. The previous owner purchased the unit in 2010 before selling to you. Prior to that, someone sold it to the seller in 2005. What if the seller in 2015 didn’t legally own the property? If that’s the case, the chain of title is broken and it’s possible that someone may make an ownership claim against your apartment. Title insurance protects both you as the purchaser and the lender, and the insurance policy covers legal fees as well as your principal. You can also purchase an additional insurance policy called a ‘Market Value Rider’ which will automatically step-up the value of your Title Insurance policy to match appreciation in the market value over time. The Market Value Rider is relatively inexpensive relative to the cost of Title Insurance itself. If you plan on holding the property for a long time, purchasing the Market Value Rider is a prudent decision since it will ensure that your capital appreciation is protected. The typical real estate attorney fee for a buyer is between $2k to $3k. Fees can be higher depending on the complexity of the transaction. There are also discount lawyers who charge less, however you should be careful that paying less for your lawyer does not sacrifice quality and possibly risk your deal. When you pay lawyer fees is negotiable. Some lawyers will only collect their fee at closing, while others may ask you to sign an engagement letter and pay half upfront and the rest at closing. In any case, it’s a good idea as a buyer to speak with a few lawyers and make a selection before you start submitting offers. Including your attorney contact information along with your offer may increase the credibility of offer and entice a seller to show more flexibility on the price or other deal terms. All condos and co-ops charge buyers a handful of fees when making the purchase. These may include a board application fee, move-in fee and/or a move-in deposit. These fees and deposits are typically no more than $2,000 combined. The board application fee itself is usually around $500, and most buildings also charge an extra $100 to $200 for a credit check fee. If you’re financing, you will need to pay a handful of mortgage-related fees which include an application fee, an appraisal fee, bank attorney fees and a mortgage recording fee. The typical bank loan application fee is under $1,000, and the appraisal fee is usually around ~$750. Bear in mind that the specific fees vary by bank. If you have private client status with a bank, you may be able to receive a credit/reduction on some of your fees as well as a reduction in your interest rate / APR.